Ever since the port agency work is a core business of our organization. Besides the dispatch of ocean going vessels, with all its related duties, engaged in the tramp or liner shipping industry we as well care for crew matters and handling ships during their dry-docking period or when passing Kiel Canal. 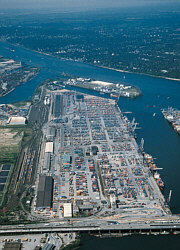 The services we offer are provided by experienced staff mainly in the ports of Hamburg, Bremen and Bremerhaven. The clearance of ships in all other German seaports or during Kiel Canal transit is handled in co-operation with sub-agents.